Halloween or Hallowe’en (a contraction of “All Hallows’ Evening”), also known as All Hallows’ Eve, is a yearly celebration observed in a number of countries on October 31, the eve of the Western Catholic feast of All Hallows (or All Saints) and the day initiating the triduum of Hallowmas. (See also Michaelmas and Christmas). According to most scholars, All Hallows’ Eve is a syncretized pagan feast originally influenced by western European harvest festivals, and festivals of the dead with pagan roots, particularly the Celtic Samhain. Though the origin of the word Halloween is Catholic, the holiday has pagan roots. Historian Nicholas Rogers, exploring the origins of Halloween, notes that while “some folklorists have detected its origins in the Roman feast of Pomona, the goddess of fruits and seeds, or in the festival of the dead called Parentalia, it is more typically linked to the Celtic festival of Samhain”, which comes from the Old Irish for “summer’s end”. Samhain was the first and most important of the four quarter days in the medieval Gaelic (Irish, Scottish and Manx) calendar. It was held on or about October 31 – November 1 and similar festivals were held at the same time of year in other Celtic lands; for example the Brythonic Calan Gaeaf (in Wales), Kalan Gwav (in Cornwall) and Kalan Goañv (in Brittany). It marked the end of the harvest season and the beginning of winter or the ‘darker half’ of the year. Samhain (like Beltane) was seen as a time when the ‘door’ to the Otherworld opened enough for the souls of the dead, and other beings such as fairies, to come into our world. The souls of the dead were said to revisit their homes on Samhain. Lewis Spence described it as a “feast of the dead” and “festival of the fairies”. However, harmful spirits and fairies were also thought to be active at Samhain. People took steps to ward-off these harmful spirits/fairies, which is thought to have influenced today’s Halloween customs. The practice of lighting bonfires during Hallowmas may have been a synchronized one with Catholicism, as the Celts lit bonfires during Samhain as well. Snap-Apple Night (1832) by Daniel Maclise depicts apple bobbing and divination games at a Halloween party in Blarney, Ireland. Halloween falls on the evening before the Catholic holy days of All Hallows’ Day (also known as All Saints’, Hallowmas or Hallowtide) on November 1 and All Souls’ Day on November 2, thus giving the holiday on October 31st the full name of All Hallows’ Eve. They are a time for honoring the saints and praying for the recently departed souls who had yet to reach Heaven. All Saints was introduced in the year 609, but was originally celebrated on May 13. In 835, it was switched to November 1 (the same date as Samhain) at the behest of Pope Gregory IV. Some have suggested this was due to Celtic influence, while others suggest it was a Germanic idea. By the end of the 12th century they had become holy days of obligation across Europe and involved such traditions as ringing bells for the souls in purgatory. “Souling”, the custom of baking and sharing soul cakes for “all crysten christened souls”, (hot cross buns) has been suggested as the origin of trick-or-treating. Groups of poor people, often children, would go door-to-door on All Saints/All Souls collecting soul cakes, originally as a means of praying for souls in purgatory. Similar practices for the souls of the dead were found as far south as Italy. Shakespeare mentions the practice in his comedy The Two Gentlemen of Verona (1593), when Speed accuses his master of “puling [whimpering or whining] like a beggar at Hallowmas.” The custom of wearing costumes has been linked to All Saints/All Souls by Prince Sorie Conteh, who wrote: “It was traditionally believed that the souls of the departed wandered the earth until All Saints’ Day, and All Hallows’ Eve provided one last chance for the dead to gain vengeance on their enemies before moving to the next world. In order to avoid being recognized by any soul that might be seeking such vengeance, people would don masks or costumes to disguise their identities”. In Halloween: From Pagan Ritual to Party Night, Nicholas Rogers explained Halloween jack-o’-lanterns as originally being representations of souls in purgatory. In Britain children would set candles in skulls in graveyards. In Britain, these customs came under attack during the Reformation as Protestants berated purgatory as a “popish” doctrine incompatible with the notion of predestination. The rising popularity of Guy Fawkes Night (5 November) from 1605 onward, saw many Halloween traditions appropriated by that holiday instead, and Halloween’s popularity waned in Britain, with the noteworthy exception of Scotland. There and in Ireland, the rebellious Guy Fawkes was not viewed with the same criminality as in England, and they had been celebrating Samhain and Halloween since at least the early Middle Ages, and the Scottish kirk took a more pragmatic approach to Halloween, seeing it as important to the life cycle and rites of passage of communities and thus ensuring its survival in the country. Development of artifacts and symbols associated with Halloween formed over time. The turnip has traditionally been used in Ireland and Scotland at Halloween, but immigrants to North America used the native pumpkin, which is both much softer and much larger – making it easier to carve than a turnip. Subsequently, the mass marketing of various size pumpkins in autumn, in both the corporate and local markets, has made pumpkins universally available for this purpose. The American tradition of carving pumpkins is recorded in 1837 and was originally associated with harvest time in general, not becoming specifically associated with Halloween until the mid-to-late 19th century. The modern imagery of Halloween comes from many sources, including national customs, works of Gothic and horror literature (such as the novels Frankenstein and Dracula) and classic horror films (such as Frankenstein and The Mummy). One of the earliest works on the subject of Halloween is from Scottish poet John Mayne, who, in 1780, made note of pranks at Halloween; “What fearfu’ pranks ensue!”, as well as the supernatural associated with the night, “Bogies” (ghosts), influencing Robert Burns’ Halloween 1785. Elements of the autumn season, such as pumpkins, corn husks and scarecrows, are also prevalent. Homes are often decorated with these types of symbols around Halloween. Halloween imagery includes themes of death, evil, the occult, and mythical monsters. Black, orange, and sometimes purple are Halloween’s traditional colors. 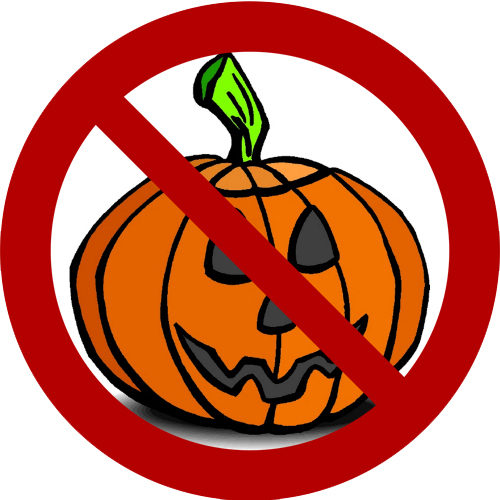 Halloween has been “cleaned up” to one degree or another and presented as “harvest festivals” in evangelical Churches. However, as Messianic believers, we strive to live lives in reverence and obedience to Torah under the example of Messiah Yeshua. These “holiday” practices are a far cry from the culture of the Scriptures and should have no place in our families or congregations.